This week will be busy, but today and tomorrow are days at home. Which means I got to watch the season finale of Downton Abbey this morning – WOW! No spoilers here, in case, like me, you tape and watch at a more convenient time, but it had a whole lot that was interesting. 🙂 All set up for next season. I heard on the news this morning that Maggie Smith says next season is her final one. I hope they don’t try to replace her – just kill her off (dramatically, with some deathbed straightening out of her granddaughters, of course) Because Maggie Smith is just the perfect Dowager Countess, I can’t imagine anyone else doing it. 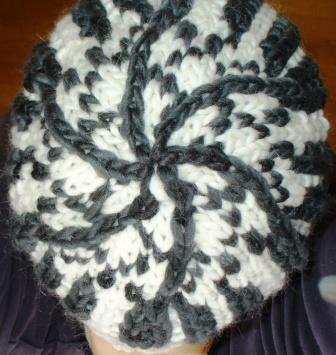 I also finished another black and white hat. I might have it out of my system. 🙂 I like this one, it is very textured and to me, at least, IS the Maine woods in winter, which was my goal. I think I will keep this one, though, not sell it or send it away. I haven’t made myself a new hat in a while, and we all need more hats, right? 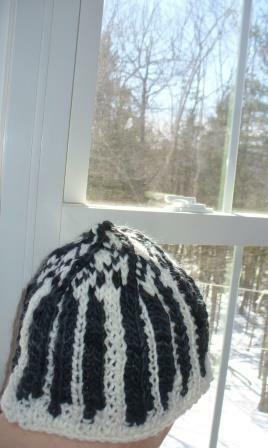 Me, looking out at those cold Maine woods, in my warm cozy hat. I will remember how cool the top came out next time I am making a hat, I really like the dark lines the decreases made. 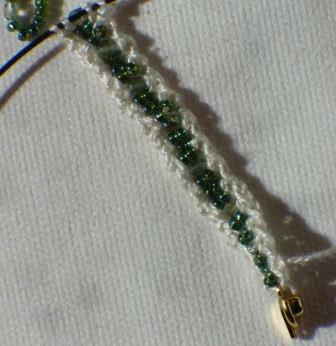 Now, back to my tinier knitting. Only three WIPS on the needles right now, which is still one more than my rule allows, but I am OK with that. 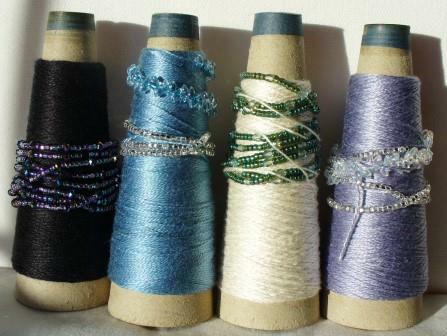 We have slow slippery blue linen with beads. We have a green and cream necklace, for when I just have a minute. We have the fabulous baby sweater which is cruising right along now. We read the Orphan Train, and the reviews were mixed. All of us agreed it was a good, fast read, and that we had no clue the orphan trains existed. And how we might not ship kids off on trains any more, but we still need to work to figure out good systems to protect them. Not everyone liked the writing, however, or how some things felt contrived and abrupt. Sometimes I think that I should resign from book group – it is far away (an hour or more, on a clear night) and I often don’t get to finish the books, so feel sort of dull. But then we have a night like last night – interesting women gathered around a fire with good treats, having fun conversations, brining our own experience to bear on the conversation. It is worth the drive. 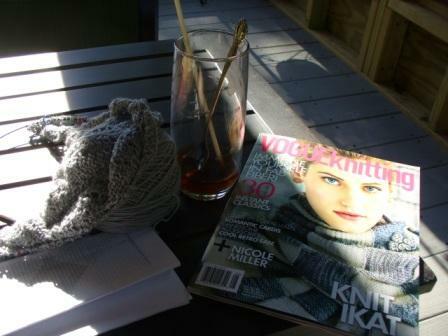 Today I have a few errands to run and a grant to work on, between bouts of knitting. I am looking forward to 2015 as a year of change and new discoveries. It is exciting and a little scary, too. Yesterday was the last day of full-time work, at a place where I have worked since I moved to Maine 18 years ago. Monday starts the part-time, phase out portion of employment, although it seems my employer really doesn’t believe that and thinks I will want to come back. I might, who knows? It is all open right now. So, in this new year, what do Fridays look like? Well, let’s start with the things I HAVE to get done. A trip to Ellsworth to return a book on disk to the library, and I may have to drive around a bit to listen to the last disk. 🙂 It is the Edge of Eternity, the third in Ken Follet’s trilogy, and while I am enjoying them all very much, I really think 28 disks is a bit much. I can’t even imagine holding that book to read it! Then I will pop over to the doctor to get blood drawn to see if my iron levels have improved. check the traps I set last night to catch that stinking nocturnal mouse who lives in our bedroom wall. I hope I catch the little creature and his whole family, too! That seems like enough to keep me busy! Author salpal1Posted on January 2, 2015 January 1, 2015 Categories how I plan to spend my day, what I am thinking about, What I readTags changes, chores, Ellsworth, New Year, to-do list1 Comment on First Friday list 2015! This morning I have to take the car in to be serviced, in Bangor, so I will definitely be knitting. I also started a new book last night, a “whodunit” by Tess Gerritsen, Life Support, so I will bring that along too, in case it takes forever. Normally, I would take advantage of being in “big city” to do a little shopping, but A and I are practicing some austerity this month, as we want to get a new pellet stove before winter, and the property taxes are due in September. If we behave ourselves, it is all do-able, but it does mean no wandering the craft and yarn stores in town. Bummer. Luckily I have a bit of recently improved stash to work with, right? o after the car, it’s home to do a few chores and possibly some yard work, if things have dried out enough to work with. 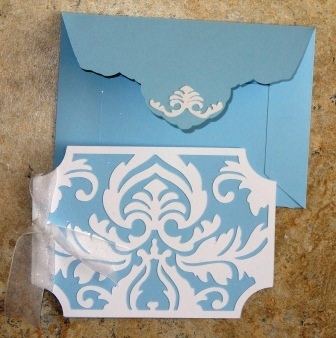 This weekend, I need to make three birthday cards for August, and I want to make a few batches of cookies to give away with them, so I’ll be busy with that over the next few days. Just not sure what will happen on Friday, and what will happen on Saturday. I’ll let you know how it comes out! Friday list and lots of other things, too! First off – MANY thanks to Maryanne at slipped stitches who gave me a good tip when I asked why I can not get the “add a new post page” to load. In case you are experiencing similar difficuly, she suggested I try getting there from my dashboard, the menu on the left, not the cute little “add a new post icon” found on each page, not the “add a new post” button on the “manage my blog” page. IT WORKED! As perhaps you can see. So, now, there will be lots of reading and photos for you as I get you caught up on what I’ve been doing this week. Second – I continue to worry about niece B who landed back in the hospital again this week, and still no conclusive results. One issue may be Crohn’s disease, and she had to swallow a blue-tooth pill camera to determine just how serious that is, but the pancreas is still not functioning properly, and no one seems to know why. She comes back to Maine for school in a couple of weeks, I told her and her mom not to forget that we are here if she needs ANYTHING or winds up back in the hospital, she needs to let us know. She has to keep intensive food journals and learn her triggers, which will be an adjustment to her, but not impossible, and she has to get on a med regime and tweak it until it works, which all is doable, but somewhat disconcerting when you are 19. I think the Crohn’s bothers me less than the pancreas at this point, but for her it is the other way around. Constant nagging worry. Third – more nagging worry – still no sign of Tigger. It is clear to me she is NOT just out enjoying hunting in a neighbor’s field or the acres of woods around us. She is either locked up in someone’s shed or garage, and so we hope will come home again this weekend; been kidnapped by a neighbor with no thought of our heartbreak (more on that); or she has helped some wild animal survive by being a meal. Obviously, our preference is not the last, although the first two aren’t great as time goes on. If she is locked up someplace without water, that isn’t good. And if the long shot, the thoughtless neighbor has her, then all we can hope is that someday she will let her out and Tigger will come home. It turns out our neighbor across the street has boundary issues with pets. She loves animals and is very focused on their welfare. As a result, she once took in a neighbor’s dog that had gotten loose. She took it with her to a family picnic half an hour’s drive away. When the family was going crazy looking for their dog, another neighbor suggested they call her, that she probably had the dog. Sure enough, she did. But then she told them if they wanted it back, they would drive over to get it! They did, but have not really gotten over it. I spoke to this same neighbor about Tigger, and she told me she had seen a cat hunting mice in her field on Monday. I spent hours in her field, calling and calling, sitting quietly with a can of tuna fish, never saw a cat, Tigger or otherwise. So we still call Tig when we get up in the morning and before we go to bed, and we still try to catch neighbors when they are home to ask about her, but if she doesn’t come home this weekend when the sheds and garages get opened up again, I doubt she ever will. Less important but still a big part of my day has been knitting and stitching. This week it has been very hot and humid, so I do yard work early, then come inside out of the sun, then go out for a short bit in the afternoon before the thunderstorms and downpours roll through. So, lots of progress! I took these photos Wednesday evening, so had to use the flash – which means sock colors are a bit distorted, but otherwise, they show how things are going along. 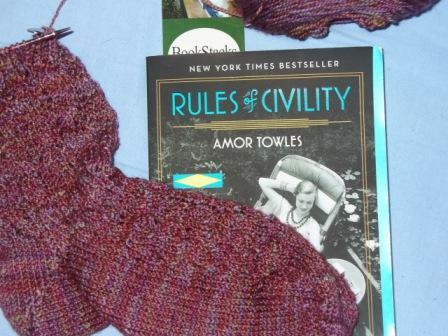 The book, Rules of Civility by Amor Towles, is a book group read. Set in NYC in the late 1930s, it is the story of the haves and the have-nots and trying to fit where you weren’t raised to be. It is very good, and while some bits are predictable, there is enough of the unexpected to make it interesting reading. It also was a reasonably quick read, taking about a week of monogamous reading to get through. The socks are based on the Poseidon pattern, found on Ravelry, designed by Elinor Brown. I definitely modified the pattern a bit – if you care how/why, you can read about it on my Ravelry page. If you don’t – well then, don’t! 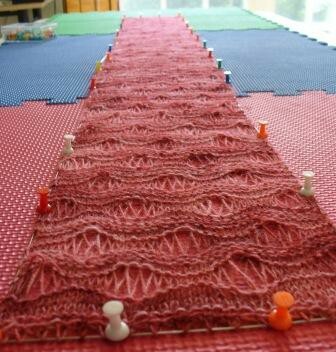 They are knitting up very nicely, I like the pattern. It took me quite a while to memorize it and be able to read what row I am on, but now that is easy, and so they are flying off the needles. Yesterday I had to go to a meeting a couple of hours away, and it is a meeting during which I knit , so I got LOTS done. I am on the leg of the second sock. 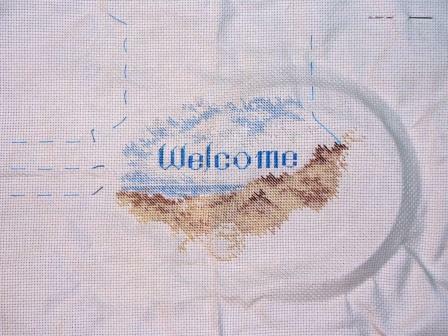 The cross stitching moves more slowly, but I did focus on it Wednesday, and so am DONE with the sand, sky and water. Now onto the surrounding shells. 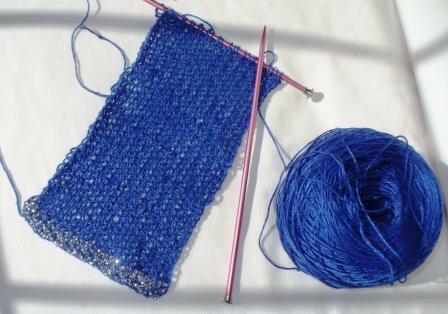 (Actually, I have one more stitch to make in the sky area, it is part of a gull, and I haven’t used that color yet, so the one stitch remains undone so far.) I’ll focus on it again this weekend, I really want to complete this by the end of the month so I can give it away. Otherwise, it will hang around with no deadlines. Wednesday was a fun day – I met Mom in Camden at the Cashmere Goat. It is a VERY nice yarn store that has been open 4 years and I never knew it existed! I love that it is spacious and not jammed with product, and yet it has a huge selection of high end yarns. The store layout is airy and open, the ladies are nice and helpful but not in your face annoying. Because we went early, we even got street parking nearby, which is VERY DIFFICULT in Camden in the summer. When we left we told them we would be back after Labor Day. 🙂 We love to see the tourists come in the summer, but we love to see them go in the fall even more. 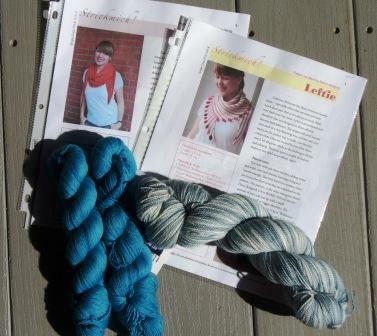 I bought a couple of patterns for shawls, one that I keep seeing all over the internet on needles and think looks interesting to make and wear is Leftie by Marina Behm. They had a sample knit up in the shop, and I knew I would have to try it. If I wasn’t committed to the sock scrap crocheted blanket, I would probably use some of my sock scraps for this. But I have another idea for it as well, which I will share if it ever seems like it will happen. While I was getting that, I figured I would get Hitchhiker by the same designer as well – after all, Claire at Mollie&Claire is making one that looks so pretty (see hers here), and they had the pattern right there for me to just pick up. And yes, I know this was a yarn store. You didn’t think I would leave it without a bit of lusciousness did you? Sock yarn – a whole section of it. Tosh Sock. A complete wall. It took me a very long time to choose one skein. And here is the amazing thing – with all the Tosh Sock I have knit this year, and a whole wall full of colors, they only had ONE color I had already used. That made it very difficult for me, I really was hoping they would only have one I hadn’t used. 🙂 I finally chose white wash, which has lovely soft faded teal tones with a creamy natural color. 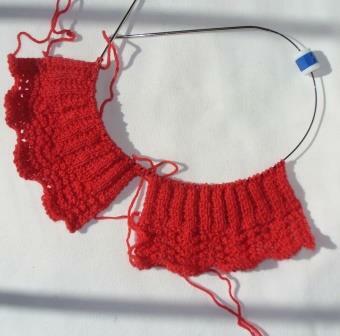 I also got a couple of skeins of Malabrigo Lace to make myself a lace scarf/shawl thing. 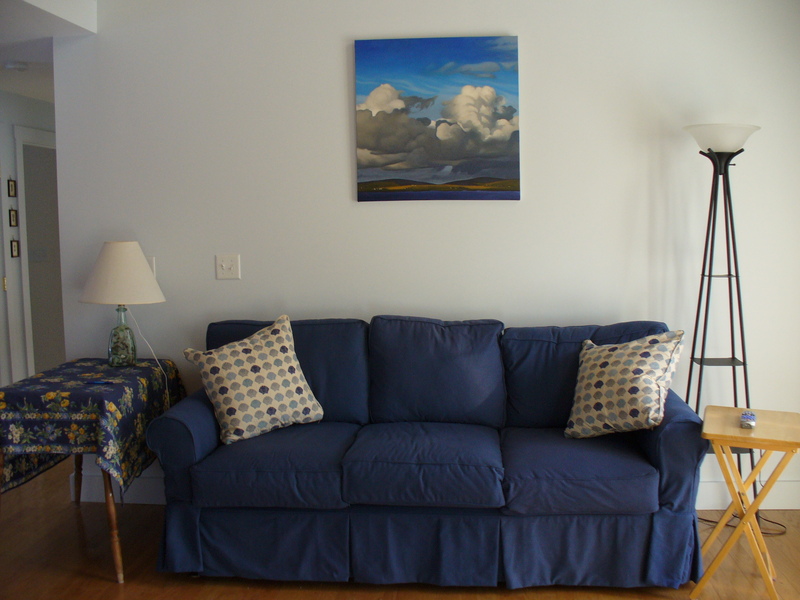 I just loved the soft blue-teal color, and the price was right. 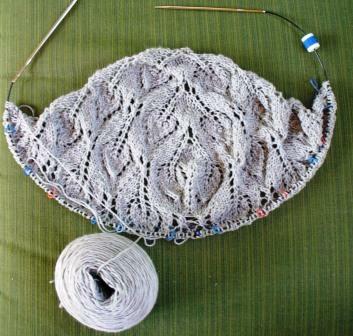 The yarn all looks pretty together, it is clear to me that when I wear the shawl, I will pair it with these socks. Mom and I were commenting that we can look at a whole wall of every color imaginable, and really love them all, but when it comes time to actually pick one out to buy, we almost always choose blue, and if we don’t, it is because we chose red. We have to really force ourselves away from those two colors. Mom did better at that than I did, getting herself a soft white/gray.black variegated to make a scarf. She loves making scarves for us all, but this one is for herself, to go with her black dress coat. By the time we finished there, it was lunch time, so we found a little place with three restaurants to choose from and two parking spaces. Our first choice of restaurant, Peter Ott’s said it opened at 11, but it was way past 11 and the door was lovked, so we went to the seafood place across the parking lot. they didn;t serve lunch. Glad there were three choices! The last place we tried, Fresh! Was interesting – it was a bit pricey, but that clearly was because they used locally sourced exceptional ingredients, and the menu was unusual. The good news? Lots of gluten-free choices. It just was hard to wrap our heads around what these things would all taste like together because we don’t usually run to gourmet eating. However, Mom located the burger, and I tried a gluten-free chicken pot pie with root vegetables (apparently, peas are root vegetables?) Both were delicious, but we decided we would not head back there soon – it was just too pricey for lunch, and we both knew our better halves would NOT appreciate the place. Then it was off to Rockland for an ice cream, then back home to Mom’s for a short time before we headed over to her summer commitment at the historical society. She does a couple of Wednesdays a summer sitting at the “Homestead” and telling visitors about the place. So far this summer she has only seen two visitors and me, so I guess some Wednesdays are slow. The house is an old one, built no later than 1777, and needs major repairs, but they have stopped the decay and done a bit of restoration on it. It looks like a sad version of my little house in Cherryfield, same layout, which was pretty standard for a cape in those days. But the ladies clearly love the place and always are working to get the next repair done. Wednesday evening, A and I went into Blue Hill to meet sister-in-law L at a presentation by a couple who traveled to Madagascar last fall. It was a couple of hours long, slde show and talk, and it was very interesting. They were birding, but had a lot of other things included in the photos and talk. Since nephew D and his wife A are living there just now, it was very interesting to us to learn more about it. It didn’t take too many photos of snakes, spiders, millipedes and lizardy things for me to decide I would NOT be going there anytime soon. The culture bits with the people, and the stories they shared about the towns they were in were much more interesting than the creepy bits, to me. And the last place they stayed, quite a nice resort with fabulous beaches did tempt me… but then I remembered I can’t go out in the sun. So, I’ll choose a less exotic place for a vacation, I guess. 🙂 The Lemurs were very cute, and the birds were lovely, though. I have to run and pick up the drycleaning, and get gas in the car, check the mail, all good exciting Friday things, right? I also want to get outside, once the trees stop dripping to do more yard work. The tomatoes are starting to come along, especially the cherry tomatoes, and I want to make shish kabobs tonight, so I need to pick some of them. Peas are still coming along, how cool our summer has really been! And the sweet peas are just starting. Squash does it’s usual thing – bloooms nicely, all male blossoms, no female, so no squash. I simply do not get it and may someday give up. When the sand dries out a bit, I will do some more clearing for the pool, it comes along, I hit a slow tough spot, but am alost through it, and HOPE that the next section goes a bit more quickly. This patch was so full of small stones that I used them to replenish the small area at the bottom of the back steps, so we won’t track so much muck in the house. Beats hauling them all off to the rock pile in the woods. I also need to contact Dish and get them to give us the national CBS feed, I tried email, they gave me a credit for the lack of the local station, but no national feed. I expressed my dissatisfaction, and they simply said “use our online chat.” Big help. Zero for customer service. That’s it, besides stitching and knitting breaks, it will be a day of work. I had better get a wiggle on! Author salpal1Posted on August 8, 2014 August 8, 2014 Categories how I spent my day, what I am making, what I am thinking about making, What I readTags book group, Camden, cashmere goat, cats, crafts, cross stitch, garden, knit, photos, pool, socks with Sarah, summer day, to-do list, vacation, WIP, yarn12 Comments on Friday list and lots of other things, too!